Posted on January 10, 2015 October 11, 2017 by TammiePainter in Books, Books, Books! Quick side note: Rivers of London is apparently the British title; In the U.S. the book is called Midnight Riot for some idiotic reason. In the first book, while trying to do his best to prove himself a capable police officer with hopes of being a detective, Peter Grant gets taken under the wing of a special unit of the police force….a unit that uses magic and investigates magical crimes. Loads of Harry Potter jokes are included. In Moon Over Soho, Peter has gained a bit of confidence in his skills and must now try to figure out what in the supernatural world is killing off London’s jazz musicians. During the course of his investigations, he also needs to figure out what sort of creature is using razor sharp teeth to chomp off certain parts of the male anatomy. Oh, and there also happens to be a Dr. Moreau-type magician lurking around creating human-animal hybrids. All in a day’s work, right? As with the first book, Peter builds on his magical skills and even annoys his mentor by improving on ways to make use of his power. Due to circumstances in this and the first book, Peter ends up doing much of his detective work on his own, which lands him in trouble when he is seduced by the woman whose last lover happens to be one of the victims of the jazz murders. Just like Rivers of London, Aaronovitch takes readers on an exciting trip through London’s streets – which is especially great when you find yourself missing this fabulous city. Aaronovitch has clearly done his research not only into police procedure, but into folklore and even physics. And, as before, the book drips with sardonic humor. Series are often a hit or miss thing. The first book can be great, while the subsequent books may be lacking. Not with the Peter Grant series. 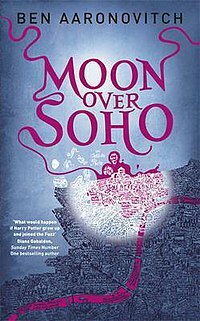 I actually enjoyed Moon Over Soho MORE than Rivers of London. The story moves more quickly and there seems to be a better pace to everything. Plus, you’re left yelling at Peter not to get involved with his seductress, but he just doesn’t listen. Have you read any of the Peter Grant series? I’d love to hear what you think.